When you want to inform quite a few number of people about a certain topic, you make sure that you do not ramble on and on about it. You need to be efficient but effective in discussing the significant details that constitutes the topic; otherwise, you fail to inform the people. Therefore, you have to have the right method in doing brief yet effective way of sharing information. One way of sharing and informing people of relevant and significant information is through briefing. Briefing is commonly used to keep decision makers updated and informed about issues they are responsible for. It can come in the form of briefing notes, longer briefing papers, or oral briefings. Briefing is the majority used method in communication between government managers and their ministers (or other senior officials). 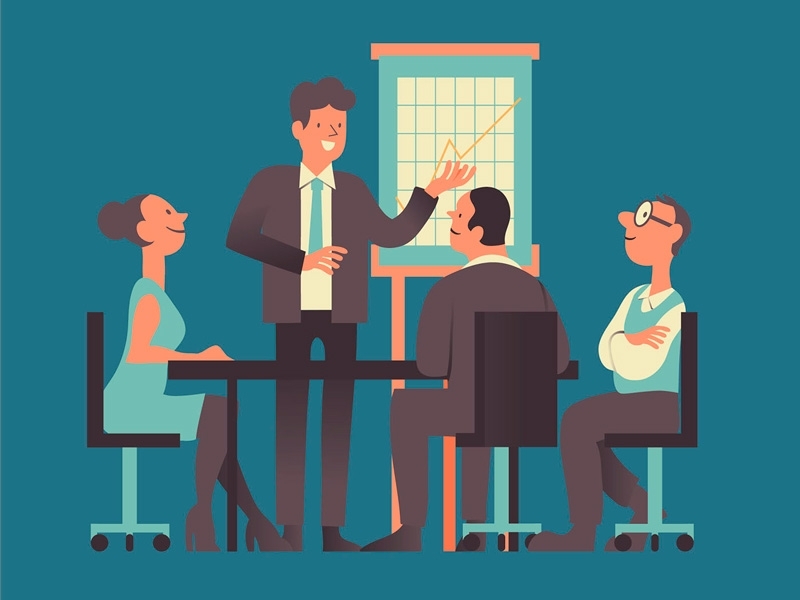 However, it is used not only limited to government officials, most big businesses used briefing a way of communicating and informing executives about certain matters and issues. Concise, clear, and reliable briefings have the ability to help individuals learn and retain information about a vast range of topics and issues that change rapidly. In addition to that, it is an effective way of helping people efficiently relay important information so that a decision can be made. 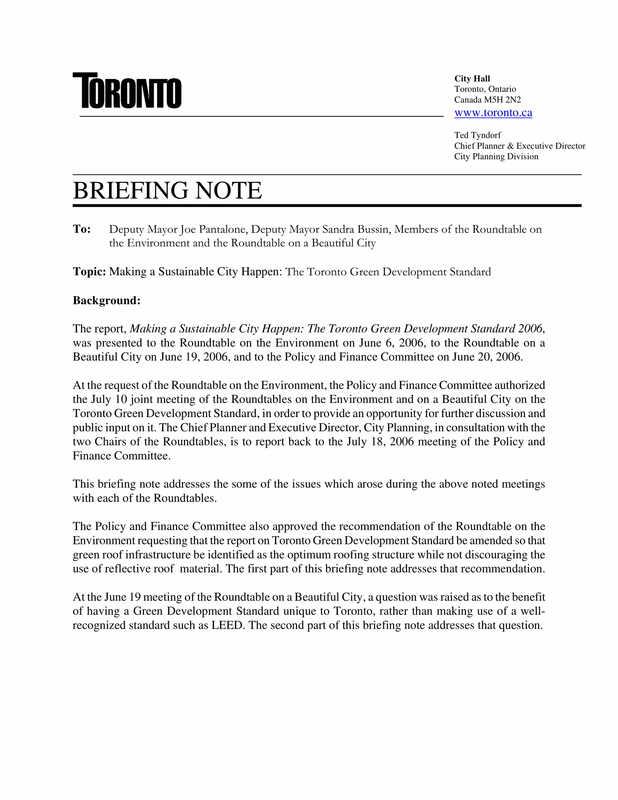 In order to quickly inform decision-makers about an issue or certain matters, a briefing note is used. 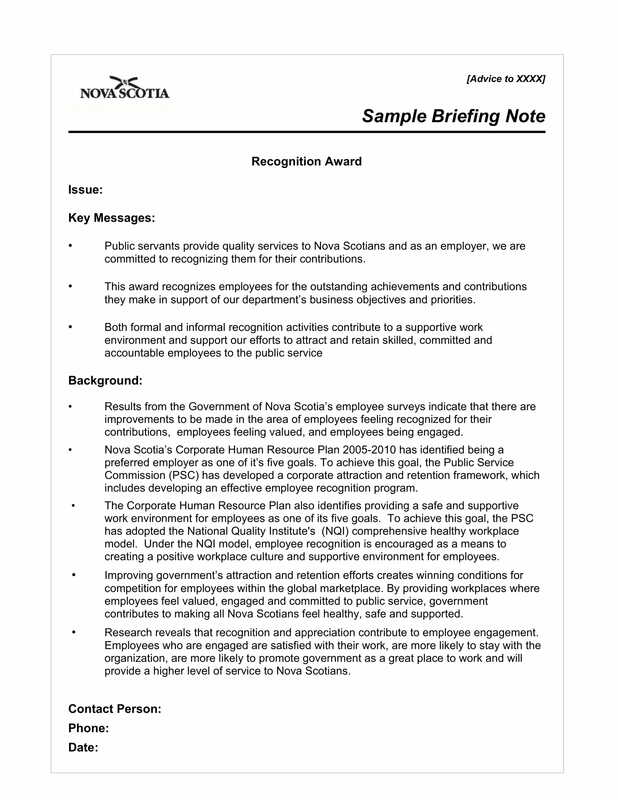 Therefore, a briefing note is a short document that summarizes a certain topic in order to inform and let the reader/s know the significant details about the topic. 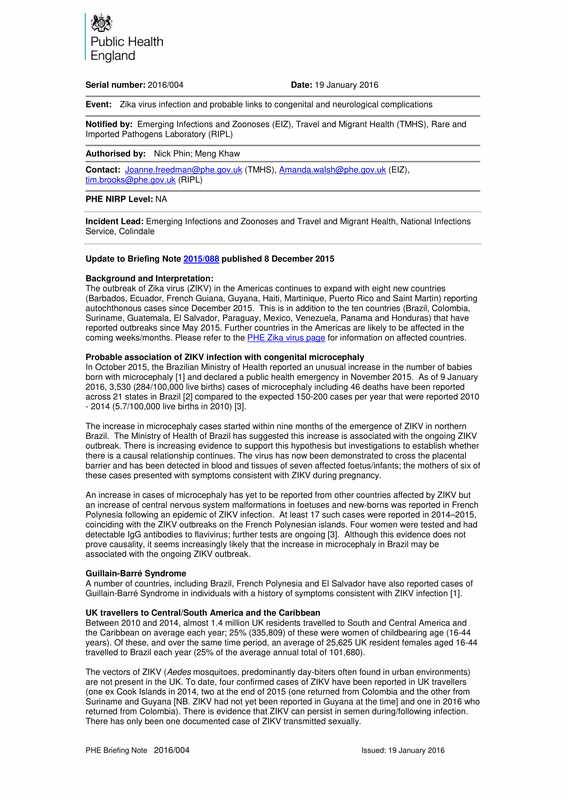 In a note-like format, the details are briefly discussed on a briefing note. Although a briefing note should be brief, it should still be full of the most significant and relevant details in order to present the issue or topic thoroughly. An effective briefing note is capable of breaking down complex information into a short, well-structured document. Since it is meant to inform the decision makes in government, organization, or company, it is meant to be concise in discussing even the most complex topics so that a decision is quickly made. Oftentimes, it is used to address and tackle issues that needs immediate action. 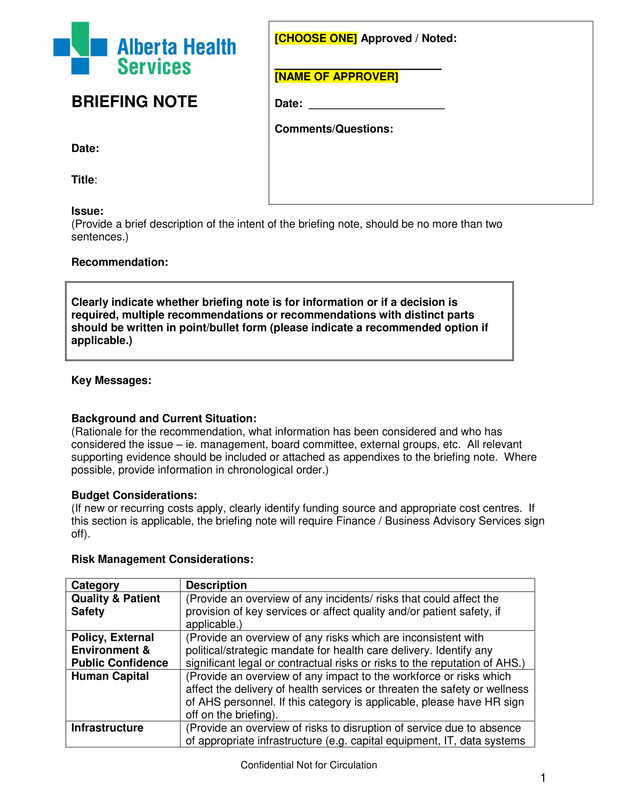 A briefing note is a useful tool to help the decision-makers retain information so that a sound and effective decision is made. 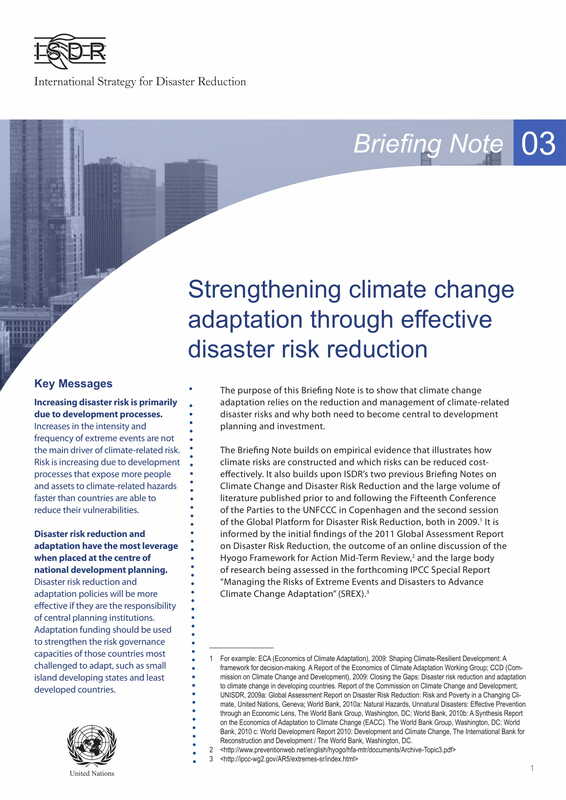 Although a briefing note is normally used to discuss or present debatable topics or issues, it can still be used for any topic someone needs to know about. 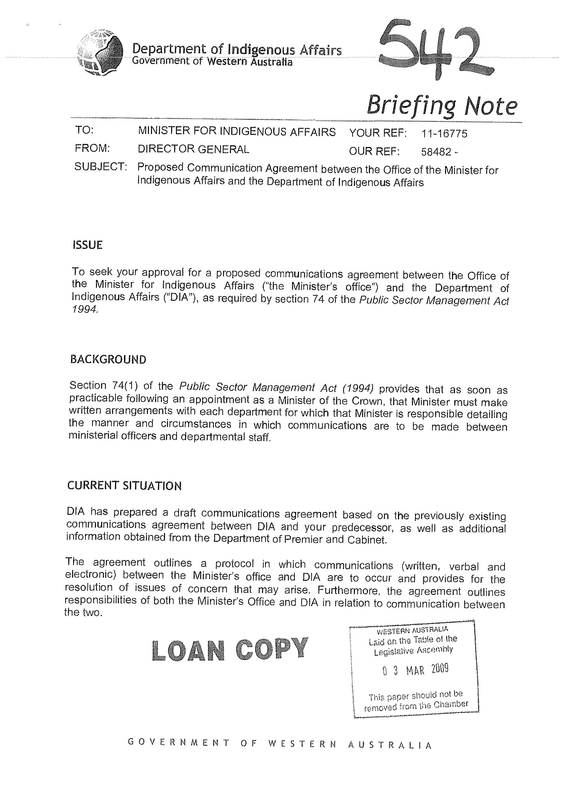 Anything that government deals with such as policy matter, a situation, a report, action by another government are commonly discussed and circulated in a briefing note format. Those topics are usually complex, but a briefing note and the way its structured can effectively encapsulate the essence of such topics. Informs or follow ups on an issue, an initiative, or a project. Plans for an event, a speech, etc. Avoids a potentially embarrassing situation or to inform someone about it. need a capsule version of the key points and considerations about an issue. Short: it should always be as short as possible; one to two pages will suffice. Concise: short does not necessarily equal concise; concise means every word is used as efficiently as possible. clear: it is important to keep it simple and to the point; only include what matters to that reader and what is relevant to the topic. Reliable: a briefing note should contain accurate, sound, and dependable information; should there be any missing information or questions about the information, it should be pointed out. Readable: the language should be plain and not technical; the design of your briefing note should be tailored for maximum readability, e.g, use white space, subheadings, lists, font, and other means of making reading easier. 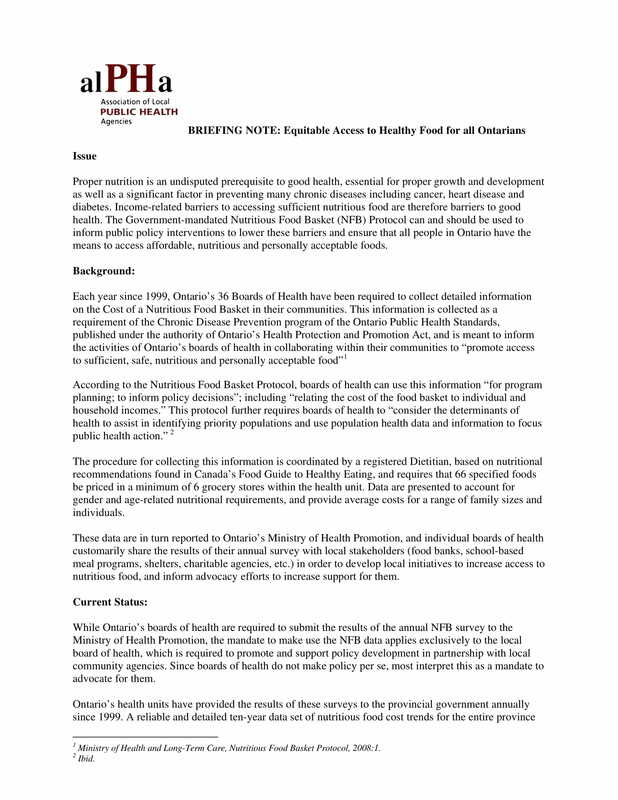 The issue section of your briefing note can also be labeled or used to discuss the topic or purpose of your note. This section is a brief description of the issue, proposal, or problem. It should be able to explain why the issue, topic, or purpose being discussed is relevant and important to the reader; overall, it should be able to explain why the reader should read the briefing note. This part of the briefing note can be stated as a question or as a direct statement on what the rest of the note is all about. As the title of this section would suggest, it gives out the details and significant relevant information relevant that would give context about the topic. It gives out the needed information so that the reader will be able to get a grasp and understand what follows, i.e., how a situation arose, previous decisions/problems, actions leading up to the current situation. This section typically gives a brief summary of the history of the topic and other background information. However, the information you include in this section must not repeat or must not be repeated in the current status section. Literally as the title means, it should only describe what the current status of the issue is. It should also include who is involved; what is happening now; the current state of the matter, issue, situation; what measures are being done; and so on. 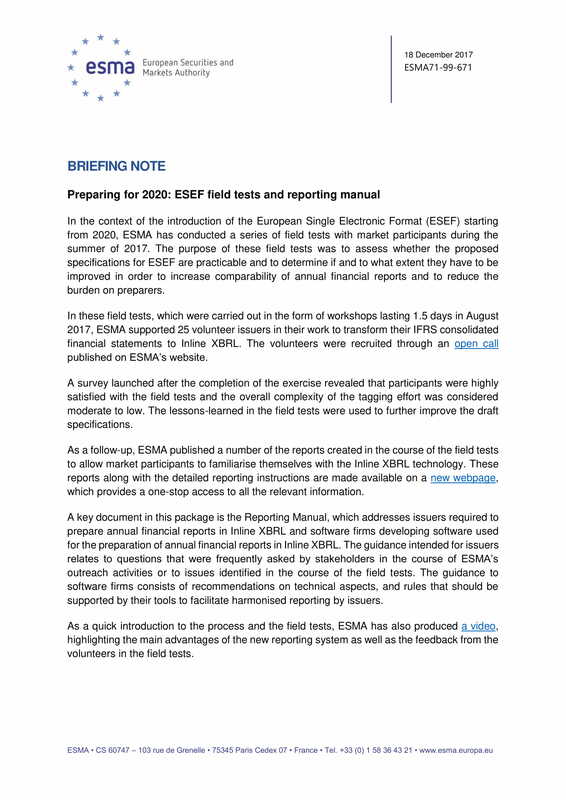 It should be able to accurately describe and tell the readers as to what is happening in the present with regards to the issue or topic of the briefing note. In this section, a summary of important facts, considerations, developments, and everything that needs to be considered now is stated. With the complexity of the issue or topic, it is important to weed out what information to include and what to leave out; however, this section should remain unbiased. Your aim should be to give the necessary information so that the reader/s can make informed decisions that will help resolve or address the issue or topic. It is important to back your statements with evidence and to double-check your facts. If there are other details you would like to add, you can attach them as appendices. This section can also be titled as Next Steps or Comments. This section basically presents and explains informative observations about the key considerations and what they truly mean. A concise description of the options can be included as well as weighing in of its pros and cons. It is important to present all options in an unbiased light so that an unbiased and well-thought-out decision is made. It is important that you summarize what you want your reader to infer in your briefing note in the conclusion section. Some readers prefer to immediately proceed to this part of the briefing note, therefore, make sure that you cover the points so that your reader can clearly understand your purpose or main goal. Also remember to avoid introducing new information in your conclusion as it should be all about what has been already discussed. In addition to that, if you want to include a recommendations section, make sure that it offers the best and most sound advice you can offer. It should be clear, direct, and substantiated by the facts you have put forward. Be clear and concise. Write sentences averaging 15–20 words up to a maximum of 30 words; write paragraphs of no more than 5–6 sentences, or 7–9 lines. Don’t assume that your reader has the same technical knowledge as you do. Get to the point quickly. Present the most important information first. Remember to give general information before giving the specifics. Summarize what you want the reader to grasp quickly. Refrain from giving your personal opinions: stick to concrete facts. Make a plan and focus on the core issue. Aim for quality arguments, not quantity of information. Don’t write before you are clear on the objective of the request. Proofread and edit before printing. 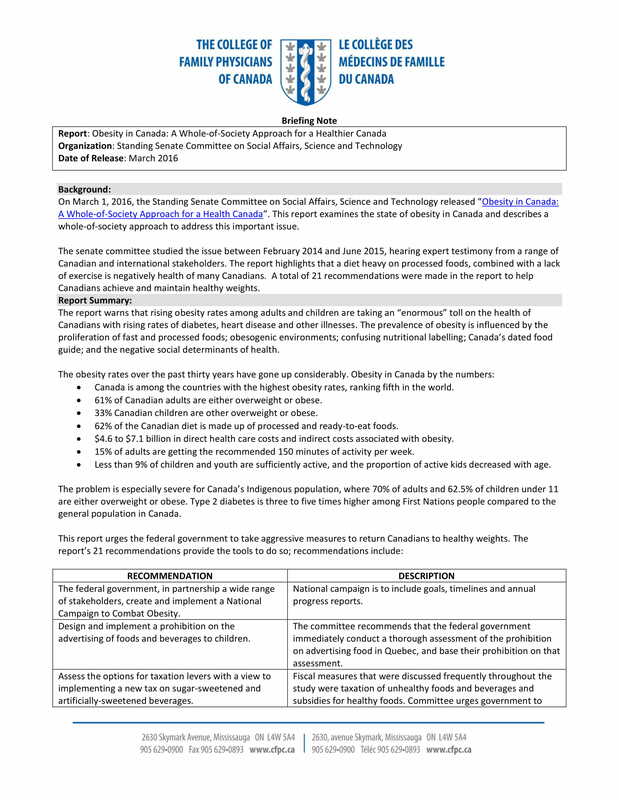 A briefing note is an effective tool in sharing details as well as informing readers about certain issues or topics. It is a good way to briefly discuss what constitutes to the issue or topics so that an informed decision is made and a successful action is taken. 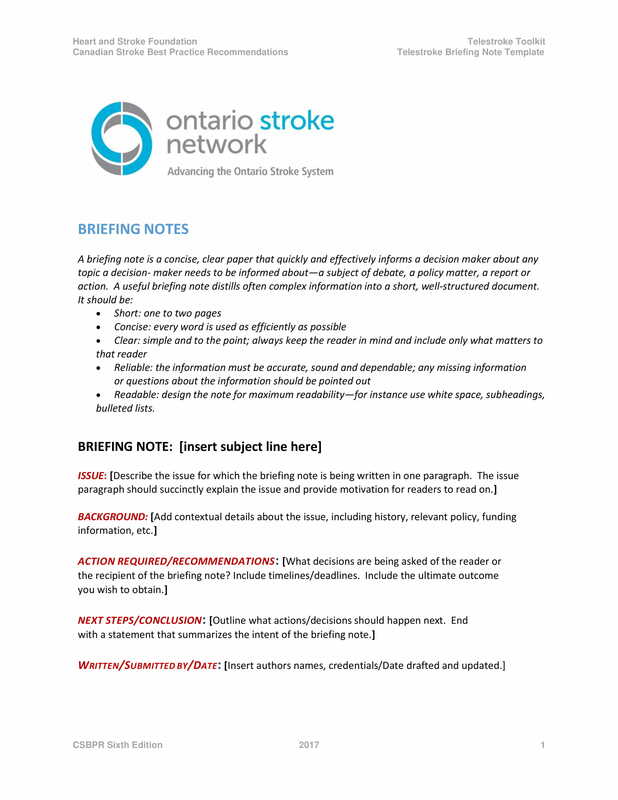 We hope that you were able to grasp the general idea of what a briefing note is through the discussions in this guide.